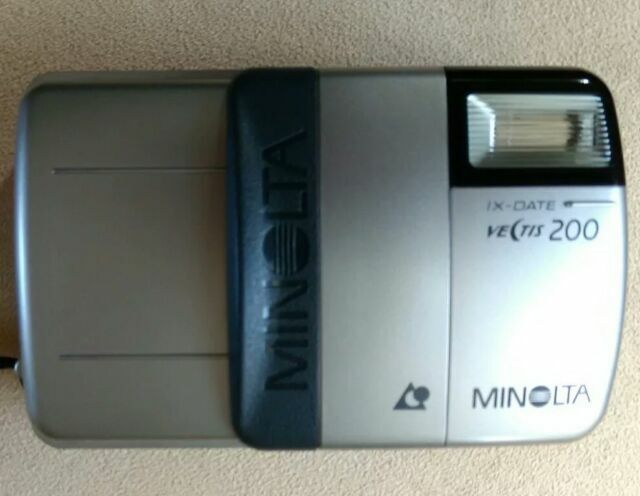 Minolta Vectis 200. Compact Zoom: 25-50mm. and including a roll of Fuji Nexia A200 25exp film (dated 03/2001). Drop In Film: Yes. Built In Flash: Yes. C for "Classic" (25.1 × 16.7 mm; aspect ratio 3:2; 4×6" print). Capture all your precious moments with the Konica Minolta Vectis 200 APS, a point-and-shoot film camera. Featuring a 2x zoom and a 31-63 mm automatic lens, this Konica SLR camera lets you click standard mid-shots with ease. Moreover, the Konica Minolta Vectis 200 APS is equipped with a built-in flash that gives you bright and clear pictures even in low-light conditions. Equipped with the red-eye reduction technology, this Konica SLR camera lets you photograph pretty faces without the subject’s pupils becoming red. What’s more, the self-timer of this point-and-shoot film camera allows you to be a part of the group picture you click.